Topics: Philosophy, Services, Radio, and Digital. Age: The domain is 19 years and 7 months old. 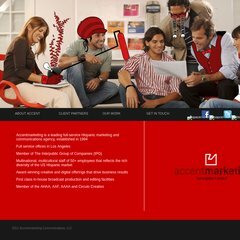 accentmarketing.com Accentmarketing | Full Service Hispanic Advertising | About Us .. The site has about 82 users daily, viewing on average 3.30 pages each. The programming language environment is ASP.NET. Terrenap Data Centers Inc (Florida, Miami) is the location of the Microsoft-IIS/7 server. It has 3 DNS records, dns1.easydns.com, dns3.easydns.ca, and dns2.easydns.net. PING www. (66.175.116.160) 56(84) bytes of data. A ping speed test response, is timed at 84.6 ms.